Sometimes I set out to write one thing, but in the course of putting pen to paper I end up with an entirely different post. This is just such an occasion. Not long after news spread about a potential film reboot of 90s sci-fi classic Babylon 5, I found myself apologizing to a friend for the series’ first season. It is a truth universally acknowledged among B5 devotees that the series doesn’t find its legs until the second season. 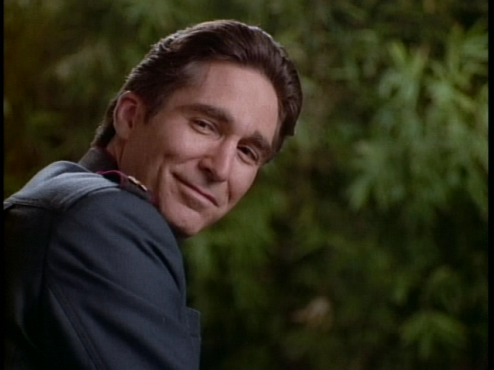 Now suppose we were having this conversation last week, and you asked me, “Adam, what’s the worst part about the first season of Babylon 5?” Last week, I would have answered, without hesitation, that the worst part of the show is Michael O’Hare as Commander Jeffrey Sinclair (pictured above). I think the best zinger I ever got off about O’Hare’s performance as Commander Sinclair was that I’d call it cardboard were that not an insult to a useful packing material. One Google search later and I discovered that Michael O’Hare died last year. To quote Admiral Kirk, dumbass on me. As Babylon 5 creator J. Michael Straczynski describes it, during the filming of the first season of Babylon 5, O’Hare began having paranoid delusions. Halfway through filming, his hallucinations worsened. It became increasingly difficult for O’Hare to continue work, his behavior was becoming increasingly erratic and he was often at odds with his colleagues. 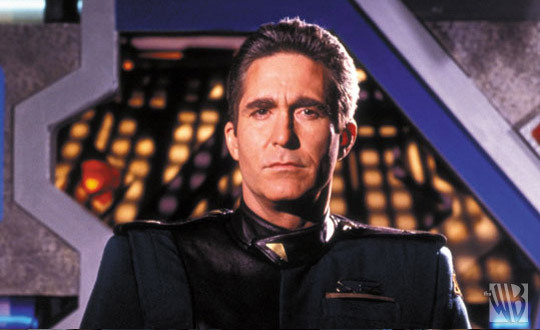 O’Hare sought treatment for his mental illness, but feared that, as the main character of Babylon 5, taking an extended medical leave of absence would destroy the show just as it was getting off the ground. Straczynski offered to suspend the show for several months to accommodate O’Hare’s treatment for his mental health; however O’Hare refused to put so many other people’s jobs at risk. Straczynski agreed to keep his condition secret to protect O’Hare’s career. O’Hare agreed to complete the first season but would be written out of the second season so that he could seek treatment. He reappeared in a cameo appearance early in season two and returned in season three for the double episode “War Without End”, which closed his character’s story arc. He made no further appearances on Babylon 5. Naturally I met this news with some level of skepticism. As I told my undergrads for many years, Wikipedia is not a valid source; dig deeper. After a bit more searching I found the following interview with Babylon 5 creator J. Michael Straczynski. In my own defense, I’m not wrong about O’Hare’s performance. Nor am I wrong about the writing being hit and miss in the first season of Babylon 5. As a critic, I stand behind everything I have ever said on Babylon 5’s first season, good or bad. As a human being who attempts to cultivate empathy as a virtue, I feel a measure of regret for my words. It might be hard to believe, but I have dipped my toe in the waters of acting. While it was always a lot of work, I never found it particularly hard. Pay attention for your cues, hit your mark, never let the audience see that you’ve mangled a line (live theatre), don’t do weird things with your hands. Because of that experience, I tend to be unsympathetic toward poor performances from actors in television and film. Michael O’Hare’s work in B5 was no exception. Knowledge of what O’Hare was enduring during his B5 tenure can’t change his performance, but it does change the way I look at it. Now I can see his work in the first season of Babylon 5 as the labour of a man who refused to let people lose their jobs because his mental illness was getting the better of him. I see the half-baked writing in some episodes as the product of J. Michael Straczynski working to help O’Hare keep it together in addition to writing and producing his show. Babylon 5 stood apart from Star Trek: TNG and Deep Space 9 because in many ways it is a much more honest version of a post-Cold War future. Humanity goes into space and we take all our baggage with us. The series explores mental illness, alcoholism, racism, labour equity, and has a more vibrant political culture than all of the Treks combined. I’d like to think that some of the off-stage personal struggles in the first season informed the character arcs in the remainder of the series, particularly with Garibaldi’s drinking and the former Earthforce officer who reinvents himself as King Arthur to hide from the guilt of his actions during the disastrous first contact between the Minbari Federation and the Earth Alliance. Even if those plot points exist independent of any real-life drama, the revelation of the latter has forced me to reconsider how I look at the first season of Babylon 5. I don’t know if/how a critical methodology for parsing media should include personal demons as extenuating circumstances. Personally, I think I need to re-watch the first season of Babylon 5 to work my way through this question. I need to filter Michael O’Hare’s work through an empathetic and critical lens. This is not to excuse the work when it is poor, but to try and understand the person who had to hide a mental illness for fear of the consequences it would have on his career and the career of those around him. @AdamShaftoe so well done. Good for you. “@AdamShaftoe: In today’s post: empathy and the first season of #Babylon5.